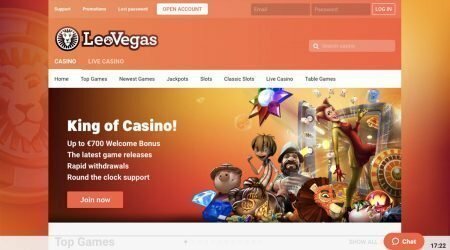 Launched in 2012, LeoVegas won the eGaming Review award for “Mobile Casino Product of the Year” in 2018 and “Online Casino Operator of the Year” in 2017. The site is certainly geared toward these two formats, with a streamlined customer experience, super-fast software and an excellent collection of games to explore on any device. 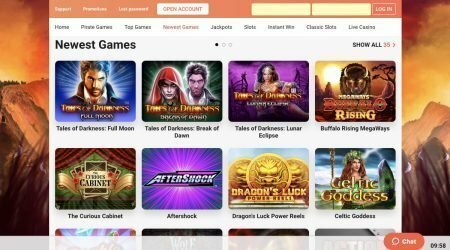 It provides access to a number of platforms, including Bally, Evolution, NetEnt and Microgaming, plus there is a live dealer room for people who enjoy that interaction. LeoVegas is fully licensed by the Malta Gaming Authority – this means that the company must protect its account holders’ details and keep separate accounts for their funds. Moreover, the bonuses are good and customer care is on hand if something goes wrong. The distinctive name is drawn from the Latin word for lion, leo, and the city of Las Vegas, which is synonymous with casino entertainment. LeoVegas has put together a selection of three welcome bonuses – one for each of its venues. At the casino, there is a welcome bonus that consists of a 100% deposit match up to a total of £400 and 100 free spins, though these are only available on certain games. To receive this offer, players need to make a deposit of at least £5 – and it’s important to act quickly as the spins expire three days after they have been claimed. The spins are released when a wager of £5 or more has been placed – to use them, members can click through to the Games section. 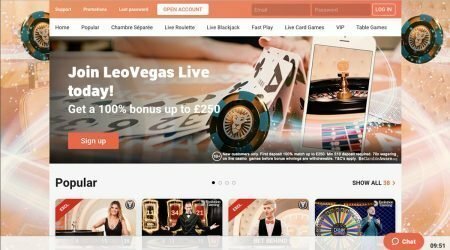 Newcomers to LeoVegas can also get a bonus in the Live Casino area. This equates to 100% of their initial deposit, up to a total of £250, and can be claimed when an account is first opened. A deposit of £10 is needed for the offer to kick in. Finally, in the Sports area, people who create an account are offered a New Player Sports Bonus. This is a profit boost of 100% to be used when betting in-play, and to access it, a first deposit of £10 is needed. The profit boost will remain on an account ready for use for 30 days after it has been accepted. (T&C’s Apply) for all bonuses. Once a bonus is accepted, the account holder must fulfil certain wagering requirements before they can withdraw any of their winnings. This sometimes causes frustration for players, so it’s always worth reading and rereading the terms and conditions before agreeing to any form of incentive. At LeoVegas, every game contributes at different rates toward the wagering requirement – these rates are listed beside the game. Generally speaking, any winnings gained from free spins are added to the player’s Casino Bonus funds, and these have to be wagered 35 times over before any money can be withdrawn. In the casino, any bonus money that nets the player a profit cannot be taken out until the bonus amount has been wagered 35 times. Once the wagering requirements are fulfilled, the Casino Bonus fund is converted into cash winnings. If players accept a bonus in the Live Casino area of LeoVegas, then they will be asked to wager 70 times that amount to meet the house’s requirements. One of the most popular promotions at this casino is the LeoVegas VIP Experience. This is a rewards scheme that allows players to track their progress with a VIP Bar. The more active they are on the site and the bigger deposits they make, the more chances they have of winning. A major part of the VIP Experience is the monthly prize draw, in which the casino awards substantial prizes, such as Apple gadgets and real-life experiences. There are seven player levels, and whichever level a player is on, they have a chance of winning as someone from each VIP group gets a prize every month. The winners are sent a code that can be used to pick out a prize from the casino shop, or they can choose a cash alternative. Anyone who participates may also receive invitations to events and birthday rewards. LeoVegas also has seasonal promotions that consist of cash prizes and a couple of free spins. When players sign up, they will be allocated a raffle ticket for the cash prize, and the more they play, the more tickets are allocated. However, the free spins are provided as soon as they log in. There are enough games at LeoVegas to keep any player entertained, from newcomers to this fast-paced hobby to the veterans who have been wagering online for years. When people have a specific game in mind, they can begin a search in the Top Games section where the best-loved titles are listed by clicking in the search box to find a game, or simply scrolling down to see what’s available. The Slots section is packed with titles created by some of the industry’s most established software providers, with legendary offerings from Microgaming, including Mega Moolah, the NetEnt favourite Starburst, and Mr Vegas from Betsoft. By clicking on the Classic Slots button, players can find iconic slots such as Super Lucky Reels, Irish Gold and Mega Joker, to save time on conducting a regular search. New titles are added each month, so it’s worth checking back regularly for fresh slots. In the Jackpots section, there is plenty of action for the high rollers, with potential winnings of over £1m on progressive slots. The titles here are drawn from some of the most famous game developers around, so players can look out for Hall of Gods, Mega Fortune Deals and Arabian Nights to boost their balance. The Video Poker area is kept beside the other casino games, and whether players prefer multi-hand or single-hand rounds, there is plenty of choice. Variations include Joker Wild, Deuces Wild, Jacks or Better and All American. Live dealer games bring the atmosphere of a live location right into the home of players, and at LeoVegas, there is a selection of table games such as blackjack, roulette, poker and baccarat. The traditional table games section is just as well populated, with additions such as Caribbean Stud Poker, Texas Hold’em and Imperial 7, each presented with stunningly vivid graphics. The sportsbook at LeoVegas is provided by the Kambi Group and has been designed to match the unique style of the casino. 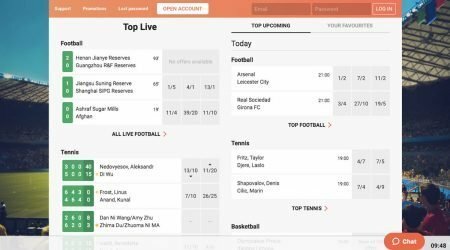 Moving around between the sports is simple, and the listings are presented in an extremely innovative format. Members just need to select a sport from the header bar, and then click on browse, outright, or live and upcoming to narrow their search. This ensures that the whole process takes less time, and the relevant odds section is also displayed when selecting a particular sport. This streamlined search is optimised for mobile users, but everyone benefits from such a straightforward format. The focus is on the increasingly popular in-play market – the bets start from just 10p, and there are around 40 sports to choose from, including tennis, horseracing, football, boxing and chess. LeoVegas accepts a range of deposit and payment methods, so each member can feel comfortable when making a transaction with the company. These include Mastercard, Maestro, Neteller, paysafecard, Skrill and Visa. 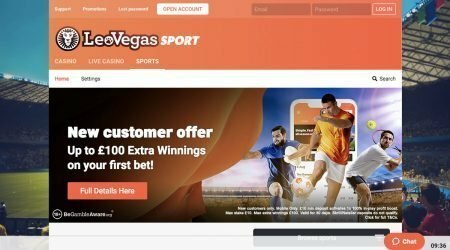 With just six years of experience in the online casino industry, it is true that LeoVegas is a relative newcomer, but by partnering with Kambi to provide some of its services, it is backed by professionals. To keep its members’ funds safe and ensure that games are conducted fairly, the casino is regulated by the Malta Gaming Authority, and it uses SSL encryption software to protect any financial transactions. By investing in a casino, a live casino and a sportsbook, it is bringing everything that players enjoy under one roof, though the sports markets are somewhat limited. 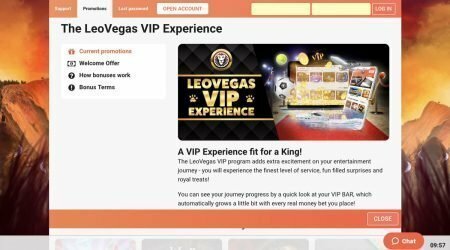 Nevertheless, navigating the site is a breeze and the raft of welcome bonuses, coupled with ongoing promotions such as the VIP Experience, make LeoVegas a good prospect for all levels of player.